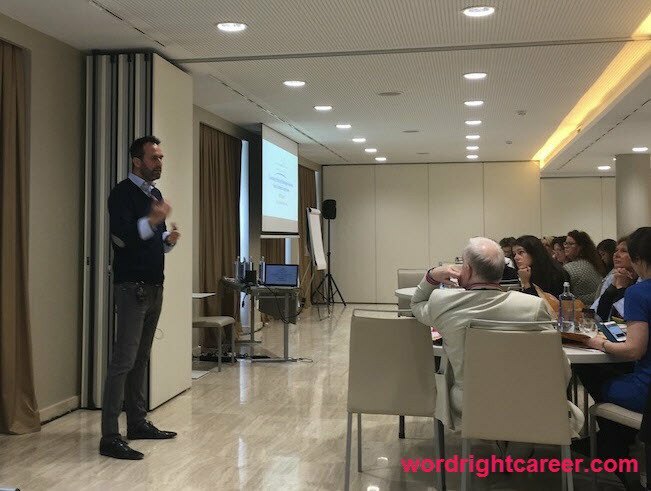 Earlier this month I had the privilege of attending a conference of world-leading career coaches and résumé writers from around the world in beautiful and historic Madrid, Spain. Conference attendees traveled from the US, England, Ireland, Canada, Romania, Poland, Aruba, France, Spain, Netherlands, Switzerland, and Indonesia. Don’t panic when you’re escorted to secondary screening (more later). As an executive career coach, I like to collect new tools and information to share with my clients. There was no shortage of expertise at this international conference set in historic Madrid. New to the digital marketplace is beBee.com, a platform for professional collaboration, including content production and distribution, affinity-based networking, job searching, social recruiting, and personal branding, and social selling. There are many bees, buzzing, and hive activity on this new platform and appeals to personal and professional interests. beBee.com lets you own your data and you can be compensated for this data. Data may be exchanged for tokens via bitcoin technology. Will be able to control their own data: They decide who can access their data and which parts of it. Will get compensated in tokens for the exchange of their data. Set their own price and therefore will feel fairly compensated every time a business gets in touch with them. Have a portable professional profile and reputation. They will not need to rely on a centralized platform. Have a look here: https://ca.bebee.com/. ​Expert branding guru Valerie Sokolosky delivered a presentation on the value of executive presence, including communication, grooming, and professional networks. In fact, Valerie also discussed language, consistency, humility, confidence, grooming, and engagement. The author of several books and a contributor to Fox News, she is a branding expert who develops authentic leaders. According to Valerie, surveys show that during the workday, the average time spent communicating is: 45% listening, 30% speaking, 9% writing, and 16% reading. Global experts in personal branding, Susan Chritton (author of Personal Branding for Dummies), discussed the various branding strategies professionals are using around the globe to grow their businesses and careers. Virgin markets for personal branding are Europe and the Middle East. Networking with 100 global careerists was the highlight of the event. Sharing expertise, strategies, and tools from decades of collective experience struck me, as I listened to the brilliance of the presenters. After more than two years since attending an industry conference, I vow to never miss another opportunity to collaborate face-to-face with my industry colleagues. Many of the important conversations—and business deals—happened after the events when we were relaxing and socializing. Network when you’re not needing to, especially when you’re not in panic mode job searching. On the golf course, or wherever your people gather, you will benefit from the affinity of your peers. Maintaining a digital presence is critical to being targeted by hiring authorities and recruiters. This is nothing new, but nevertheless important to your career strategy. Socializing with industry peers can be a way to learn new skills, gain knowledge, and build affinity. Take advantage of opportunities even when you feel you don’t have time. When you go to Madrid, take a day to travel to nearby Toledo, a 30-minute scenic train ride to the original capital of Spain. Additional presenting authors from the conference included Elisabeth Sanders-Park (Six Reasons You’ll Get the Job and No One is Unemployable), John Lees (How to Get a Job You’ll Love and many more), who all delivered cutting-edge career strategies. A final key takeaway from my trip to Madrid is to not panic when escorted to secondary screening at the airport. When I was about to board our flight to New York City, I was abruptly informed to follow the security guard to an area of the airport where I and my bags were searched in minute detail. My passport and boarding pass were also temporarily confiscated and scrutinized in great detail. Not being able to speak Spanish, I secretly wished I had learned at least a few basic phrases in Spanish to help navigate these types of situations. However, after 20 minutes, I was finally escorted back to my travel companions where we boarded the plane for a quiet and uneventful trip back to New York City. Maureen Farmer is a 9x credentialed career coach and resume writer anchored in Halifax, Canada, serving clients globally.